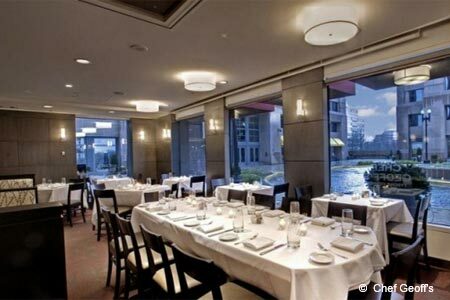 : Savvy chef Geoff Tracy’s Tysons Corner restaurant has an expanded seating area to include a pleasing outdoors terrace and offers reasonably priced valets to help out with the very sparse parking. Indoors, noise and laughter tell the story: people are having a great time, clustered at the bar or seated in the several-sectioned dining area. As with all his restaurants, he stresses casual Americana with his own twist: a tuna sashimi napoleon with wasabi aïoli as a starter, for example, or the crispy calamari with a trio of sauces. Then diners can get down to serious eating. The kitchen turns out several killer burgers; choose between a bison or beef burger, or an Italian burger served with pancetta. You can fill up on pizzas, pastas, entrée salads or some standard meat offerings: pork chops, pan-roasted trout or a filet mignon with a bacon relish. To end the meal, sample the chocolate turtle cheesecake. Note that the restaurant also features a bacon bar and a kids’ menu.